Sky Time is a free and open source game made to run on the XO laptop, which is part of the One Laptop Per child initiative. A team of Rochester Institute of Technology students will be honored for its educational game Sky Time at the White House Champions of Change event on July 23. The event, hosted at the White House, seeks to highlight civic hackers—innovators who apply their tech skills for public good— and celebrate the best projects to emerge from the Hack for Change event that was part of the National Day of Civic Hacking. Sky Time is an educational game designed to teach young students—roughly kindergarten through second grade—how to tell time. 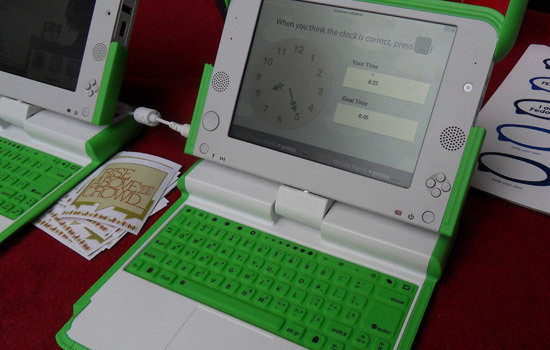 It was made for the Sugar Learning Platform, which was originally developed for the One Laptop per Child XO computer. It also runs on conventional laptops and PCs. The game was created by RIT students Jennifer Kotler, a fourth-year medical illustration major from Merrick, N.Y.; Ryan Stush, a fourth-year new media interactive development major from Mifflinburg, Pa.; David Wilson, a fourth-year game design and development major from Nahant, Mass. ; and Ian Furry, a fourth-year game design and development major from Roslyn, Pa.
“Our team is so excited to have Sky Time acknowledged as an innovative, educational game, not to mention thrilled to have our game included in such a prestigious event,” says Kotler, the lead of the project who will represent the team in Washington, D.C.
Sky Time began as a class project in a Humanitarian Free and Open Source Software course designed by Professor Stephen Jacobs and taught by Justin Sherrill. The class is offered through the School of Interactive Games and Media in RIT’s B. Thomas Golisano College of Computing and Information Sciences. The game was refined during the Rochester Hack for Change Hackathon, an event hosted by RIT’s MAGIC Center and orchestrated by Remy DeCausemaker, research staff in the Free and Open Source Software (FOSS)@ MAGIC initiative, which is sponsored by Red Hat Inc. 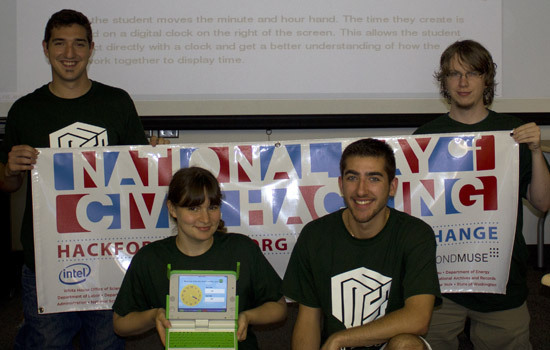 The hackathon was part of the White House’s National Day of Civic Hacking. All four students are working with the FOSS@MAGIC initiative this summer to create other One Laptop Per Child games, through the Summer Undergraduate Research Fellows program. To learn more about Sky Time, go to playskytime.com.